ELMER, NJ-Grey Vanaman began his audio career in Sunday school at 10 years old, 20-watt amplifier by his side, microphone in hand. By the time he finished high school he had already rebuilt several church PA systems. But throughout school Vanaman wasn't encouraged to start a career in audio, so he traded his microphone for a scalpel and went into nursing at a hospital full time. Still intrigued by technology, he continued to work with AV on the side, doing small projects and making a name for himself in the install community. After several years Vanaman felt confident enough to leave nursing and establish his one-man company, Audio-Clear, as a full time gig. The Miracle Temple Church of God in Christ features new clustered Turbosound TXD-151 boxes. Audio-Clear also installed 18 subs on the sidewalls, barely visible under the projector screens. Vanaman built his success on doing smaller installs in churches, providing them with quality gear at an affordable price. He explained: "Churches' needs are expanding. They see mega churches with mega sound systems while the equipment is getting less expensive. That technology is filtering down into smaller churches. They might call me up and say, 'How do we get on-stage, in-ear monitor mixers?' A few years ago that was dreadfully expensive, but nowadays it's easy to do and there are plenty of options." As the demand grows for higher quality audio in smaller venues, such as churches and schools, Vanaman capitalized on the digital revolution by employing the latest line of digital mixers. "Digital mixing has finally come down to a level where most end users benefit. There are a lot of churches putting in digital mixers that used to be reserved for studios five or six years ago. I think I have the edge over some installers that may be afraid to use this technology." 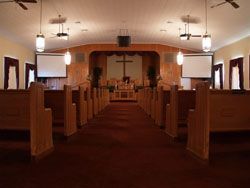 Audio-Clear recently did an install at the Miracle Temple Church of God in Christ in Millville, NJ. Vanaman installed a pair of clustered Turbosound TXD-151 boxes with 18 subs on the sidewalls. The coverage in this 300-seat church was excellent, with minimal spillage off the sidewalls. Vanaman noted, "What Turbosound has done with their TXD line is develop affordable boxes that sound incredible. And even though they're passive, and I'm not a big fan of passive boxes, they still sound really excellent. I've been using a lot of them on smaller installs nowadays and they've been benefiting me because they're very inexpensive and sound like boxes twice their price point." Vanaman also raved about the use of the Sennheiser Evolution wireless series. He frequently recommends them to his clients during the preplanning of an install. "I started using them 10 years ago on an installation and thought they were great. So I bought a set of four and they've been with me for five years and have never been serviced. I can count on one hand the number of times they've dropped out. The price point is cheaper than similar units and I can tell clients from my own experience that I've used them for years on the road." Lately Vanaman has been installing more signal processing gear, an expense that most smaller venues couldn't afford before the all-in-one rack units. With the Drive Rack PAs he's able to give them what they crave at a reasonable price. "It has what people need, it's user-friendly and doesn't take much time to setup. I haven't had any service calls for any of them I've installed."